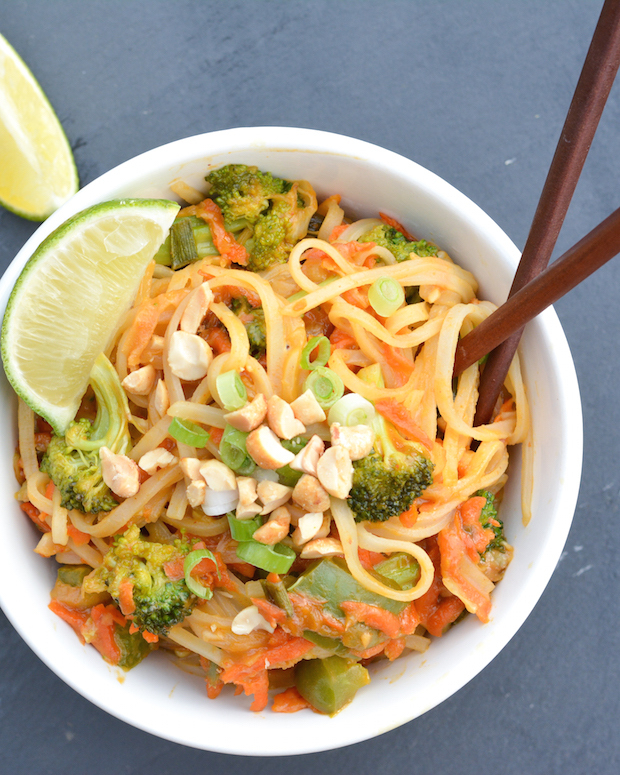 These Veggie-Packed Peanut Noodles are a great quick and easy weeknight vegetarian meal that can be made in under 30 minutes! They taste decadent but you can feel good about getting in lots of veggie servings! Can you guys believe it’s already 30 Minute Thursday again? Seems like yesterday that we kicked off this series with September’s roundup. September sure did fly by. And now that we’re getting into the holiday season, things are about to get real. Everyone could use a little extra free time, so why not free some up with quick and easy dinner ideas? 30 Minute Thursday to the rescue! I was home alone a lot this month, and when that happens I don’t always make the best food choices. When I don’t have to cook dinner for anyone else, I usually don’t cook it for myself either. Chips and hummus is perfectly acceptable dinner, right? Or cereal? Or… ice cream? I kinda needed to save myself, so I wanted to make something with tons of veggies packed in. Give me some nutrients! 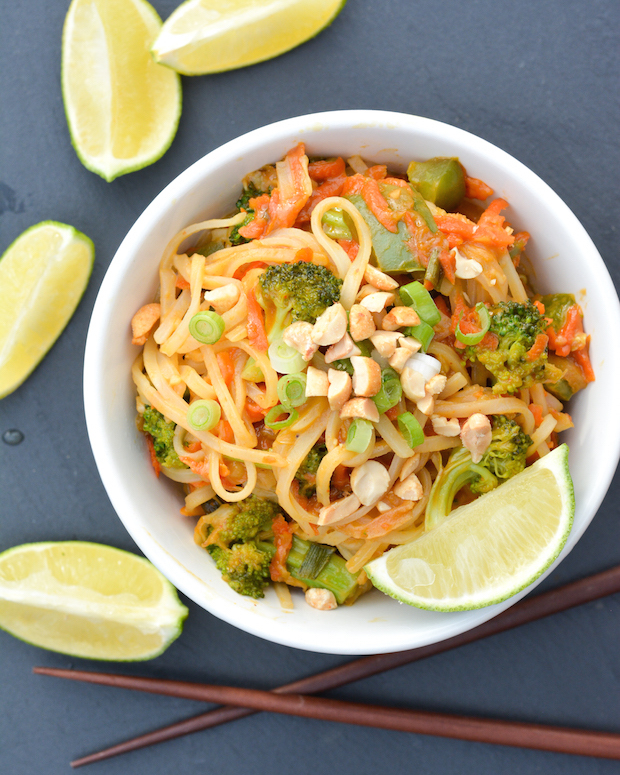 These Peanut Noodles were the perfect vehicle for lots of healthy stuff. The sauce is creamy and decadent, but it doesn’t feel so bad when you’re eating lots of veg. Rice noodles are perfect for this dish, but if you can’t get your hands on any you could definitely use regular linguini. Just cook it according to the box directions (and not the soaking method you use for rice noodles). Place noodles in a large bowl or pot. Pour boiling water over top and let sit according to package directions (about 5-10 min) until soft. Drain and set aside. Heat sesame oil in a large saute pan or wok over high heat. Add garlic, broccoli, pepper, and green onion and stir fry until beginning to soften, about 5 minutes. Add carrots and cabbage and continue stir frying 3-4 minutes until just barely softened. Reduce heat to medium and add ground ginger, honey, peanut butter, soy sauce, rice vinegar and sriracha. Stir until combined, veggies are evenly coated and sauce is heated through. Add rice noodles to the pan and stir everything together to evenly coat. Serve topped with chopped peanuts, green onions and lime squeezed over top. I loved these noodles and they were great served either hot or cold. They were perfect as main dish, but you could also serve them as a side dish alongside some chicken skewers or steak tips! This looks like the perfect way to get my veggie fix! I can’t believe I’ve never made peanut noodles before! I definitely have to change that after seeing this recipe, especially since it’s ready in just 30 minutes! Yum! I’m a total SUCKER for any veggie-loaded pasta, so these gorgeous noodles are totally calling my name! Love all the awesome Thai flavors you packed into ’em! Oh these noodles are calling my name!! I love all the veggies you added! I think chips and hummus are acceptable for dinner, but these Thai noodles are definitely better! I love these flavors, and could eat this every day! Well, you are well aware of my terrible eating habits when it comes to dinner. A seriously problem when living alone! Peanuty noodles are my favorite kind of noodles, so loving this dish! I swear you made this just for me. I am craving noodles so much! This looks delicious Jess! This is totally going on the weeknight menu for next week! 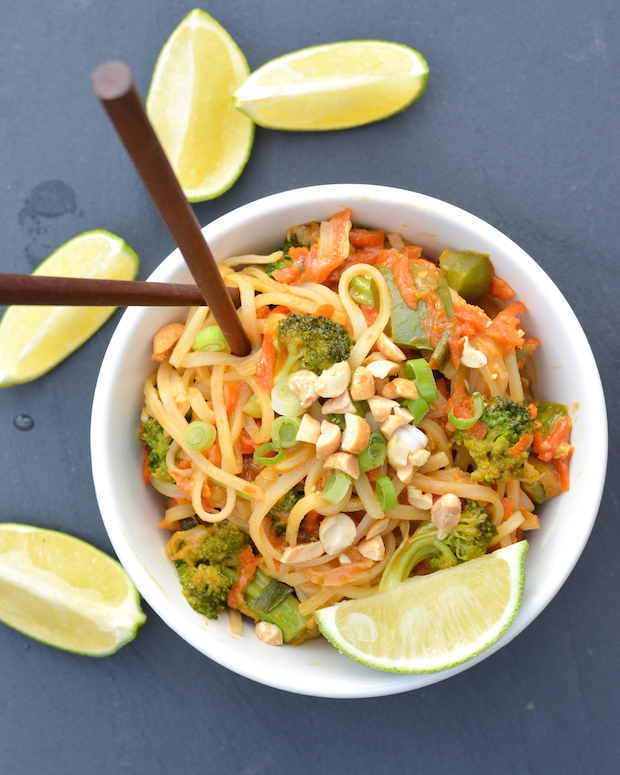 I do love me some veggies and noodles, but the addition of the peanuts really makes me want some of this right now! When I’m home alone I don’t like to cook, I just go for easy stuff haha. This dish looks so delicious, you ladies are totally coming up with some of the best dishes for 30 minute Thursday! There is nothing better in this world than peanutty noodles, and these look so delicious! I am really bad at making good food choices when I’m home alone, too! Chips and hummus is totally acceptable for easy dinners 🙂 These peanut noodles look perfect! Love all the veggies you packed in here! I’ve been known to eat cereal for dinner on many occasions. So no judgements from me on your choices of dinners! Although I’ll take a bowl of these noodles for dinner any time. I love how many veggies you’ve packed in here and the crunchy peanuts on top! Thanks, Kristine!! The peanuts definitely made the dish!